Most people are bananas for milkshakes, be it strawberry or chocolate-banana. Delicious as well as nourishing, milkshakes have acquired a vital place in popular culture. Milkshakes often provide the much-needed cool factor at the height of summer. However, many think they are barred from the deliciously creamy world of milkshakes. If you’re lactose intolerant or follow a vegan lifestyle, going out to buy a milkshake whenever the urge hits you, might not be an option. There can be a host of reasons why people steer clear of dairy products, but that’s no reason to distance yourself from this amazing refreshment. Almond milk is one way to reintroduce milkshakes into your life. Since the early 2000s, the popularity of almond milk has been on the constant rise. Today, almond milk surpasses the individual popularity of soy, coconut and rice milk. Almond milk has a sweet and mild flavor that not only blends easily with other ingredients in any recipe, but also tastes great on its own. The health quotient of almond milk is also good. A healthy heart, strong bones and glowing skin – almond milk seems to offer a full package of health benefits. The protein and vitamins in it also promote healing and strengthen the muscles. This almond milk banana smoothie is yummiest to say the least. 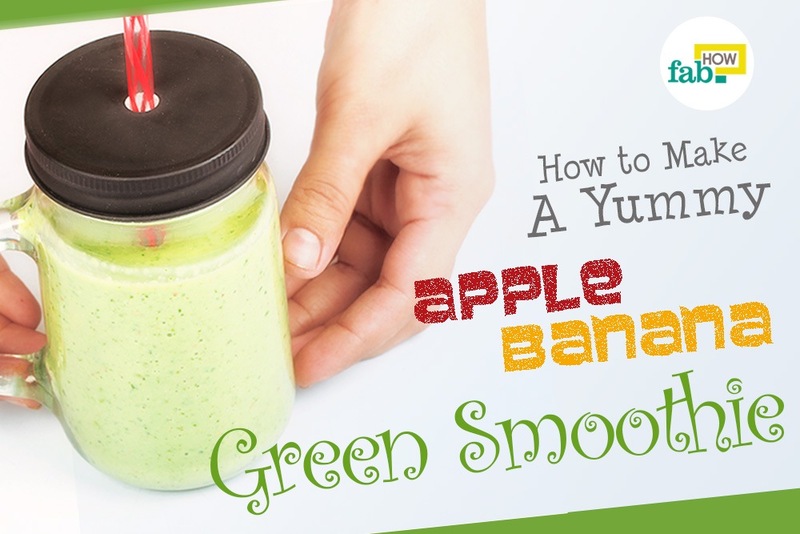 It is a nutritious beverage that you can easily make and serve to a crowd or enjoy by yourself. Bananas are a high-power fruit that are good for people with a physically active life like athletes, people who regularly participate in sports and fitness freaks. Bananas have a great combination of vitamins, minerals and good carbohydrates that work to enhance endurance in athletes. 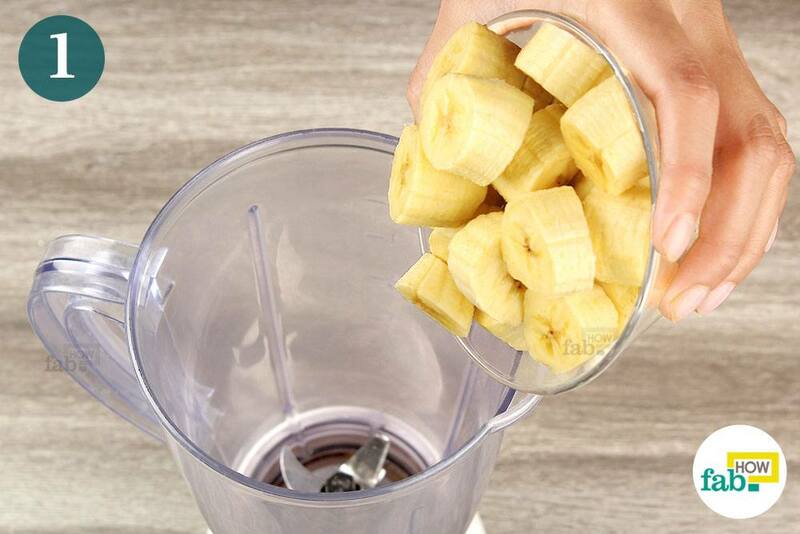 The water content along with the dietary fiber present in bananas improves digestion as well. Bananas have a great combination of vitamins, minerals and good carbohydrates that work to enhance endurance in athletes. The water content along with the dietary fiber present in bananas improves digestion as well. Add ¼ cup of peanut butter and 2 to 3 tablespoons of chocolate spread to the blender as well. 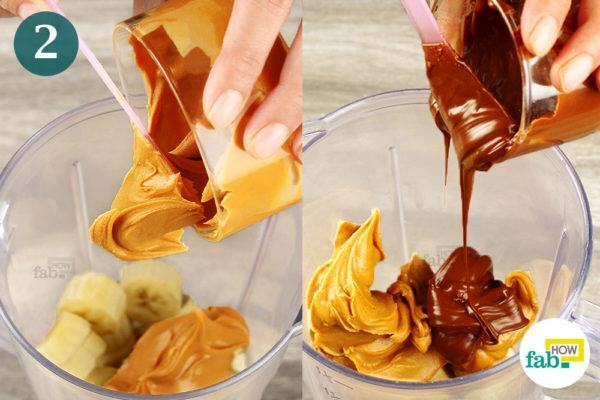 Homemade peanut butter is a good alternative to the store bought peanut butter. 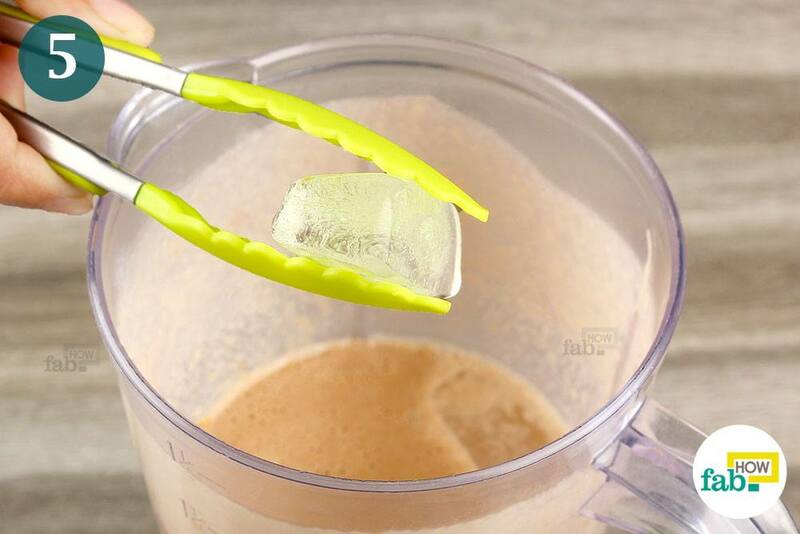 These add to the flavor and texture as well as thicken the shake. 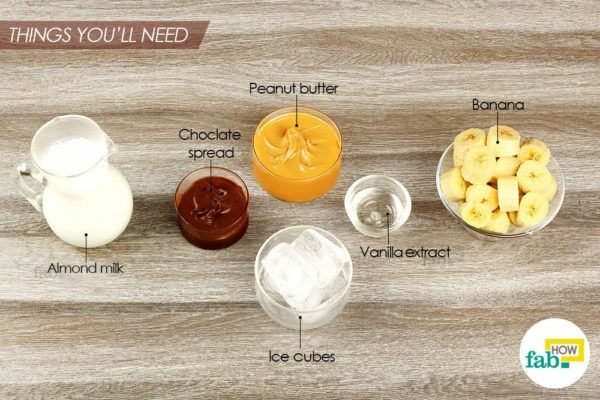 The flavor of the chocolate spread goes very well with bananas. 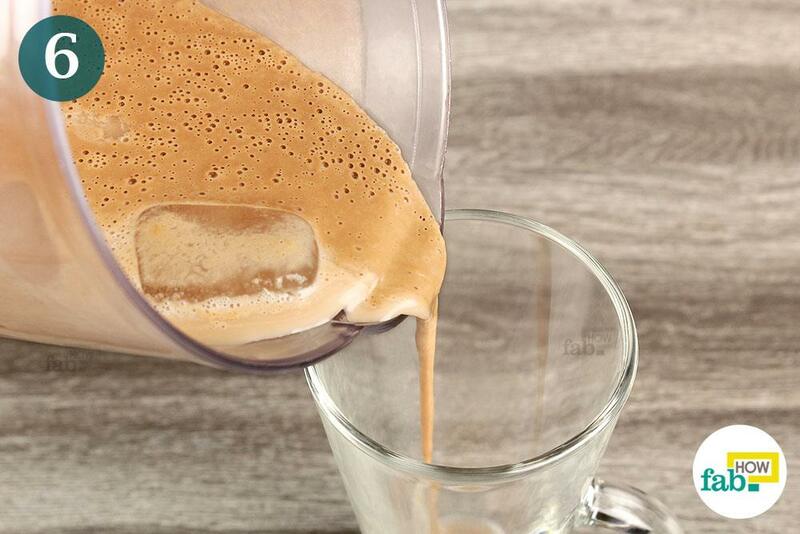 Pour 1 cup of almond milk into the blender. You should be able to get almond milk at any grocery store near you. You also have the option of making almond milk at home. Almond milk is a very popular nut milk that many people use as a non-dairy milk option. In addition to being delicious, it is replete with the bulk of the nutrition offered by almonds. 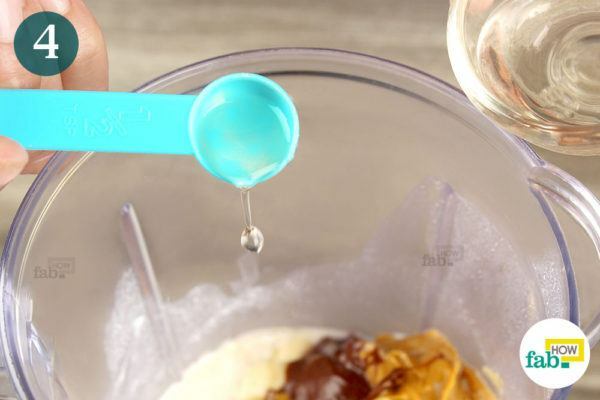 Add ½ teaspoon of vanilla extract and blend on high. Run the blender until the contents run smooth. Add 2 or 3 ice cubes and pulse again for 30 to 60 seconds. Pour the shake into a tall glass and enjoy. 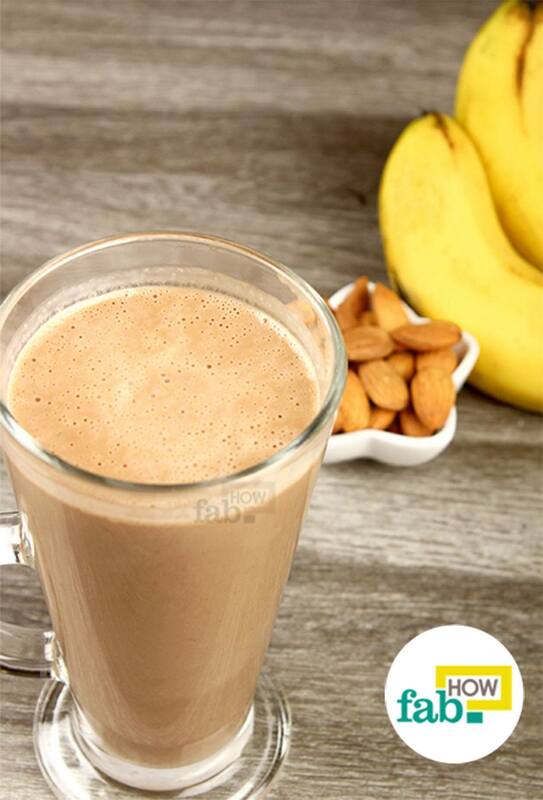 This delicious almond milk and banana shake has a nutty deliciousness to it. You can also enjoy this shake with a scoop or two of vanilla ice cream. Chocolate or banana ice cream are good choices, too. A dollop of whipped cream will also make a delicious garnish.Whipped cream is also an ideal topping for ice-cream floats. 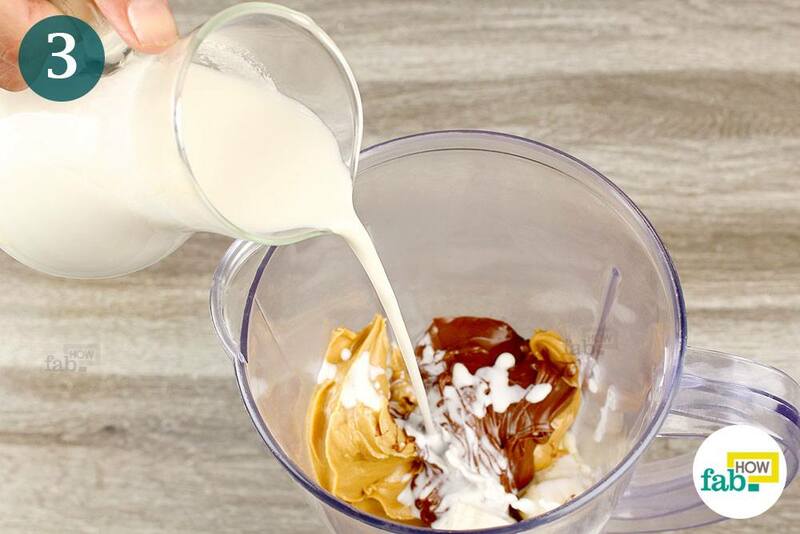 When it comes to this almond milk shake, you can let your brain go nuts with yummy ideas! You may use crushed ice for convenience instead of ice cubes. If you chill the bananas and almond milk beforehand, you shouldn’t need to add ice at all. For the chocolate flavoring, you may use chocolate sauce or chocolate powder instead of a chocolate spread. 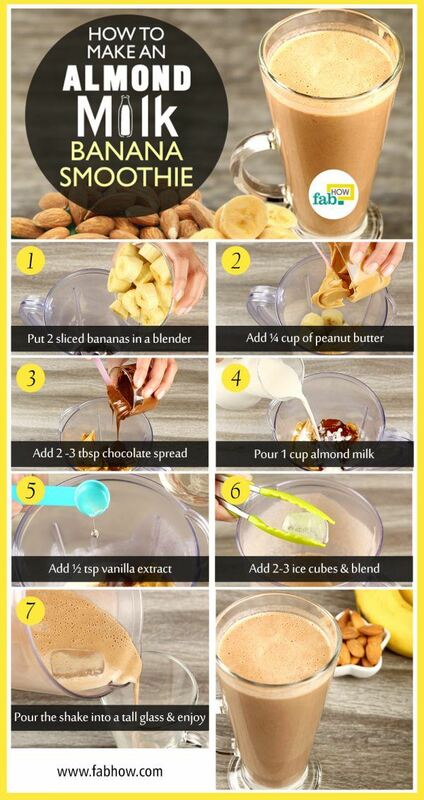 You can also add 1 to 2 tablespoons of protein powder to this shake if you wish to gain weight. You can make different shakes with almond milk. The next time you make it, try strawberries, mangoes, raspberries, blueberries or peaches for flavoring. If you’re intolerant to nuts, you can use coconut milk for your milkshakes.